Bring back that rural look into your suburban or city home with a look that has always remained trendy, with a rustic look. 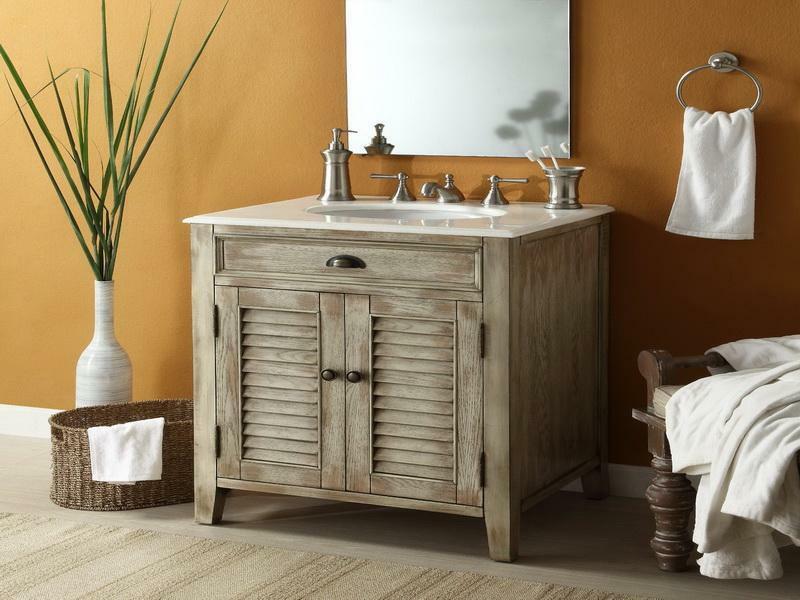 I love the look and flow of some these bathroom vanities and I’m sure you’ll find one that you like the best. Are you planning on installing these yourself? Be sure that you have these tools to help you along the way: Level, finish nailer and a cordless drill. 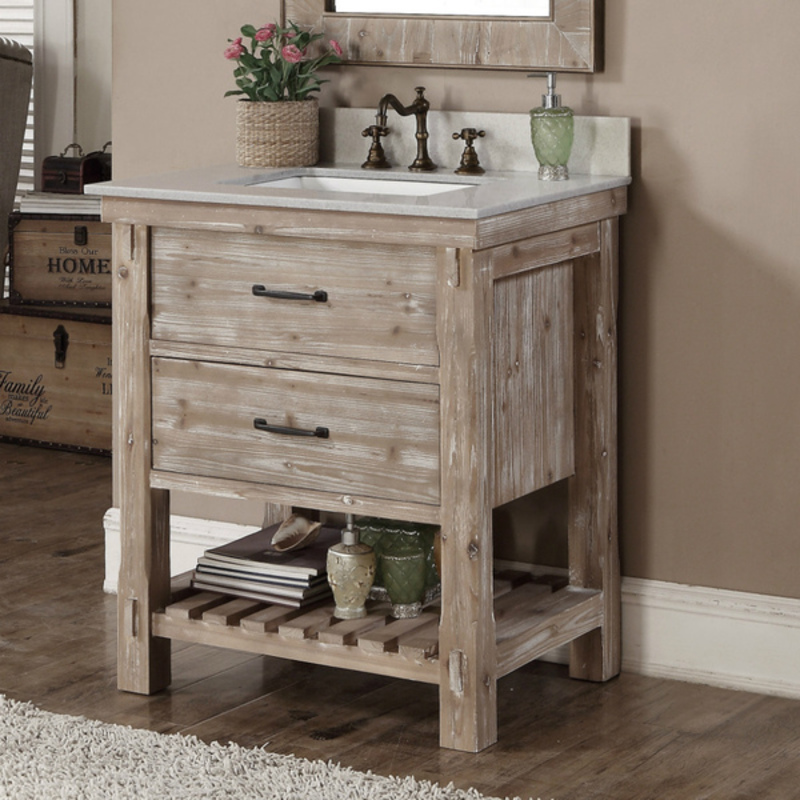 This is a beautiful country style rustic bathroom vanity with open storage below the sink for easy access to towels and toiletries. I love the distressed copper look of the pull knobs and faucets. The natural wood stain flows perfectly well with the the marble countertop. 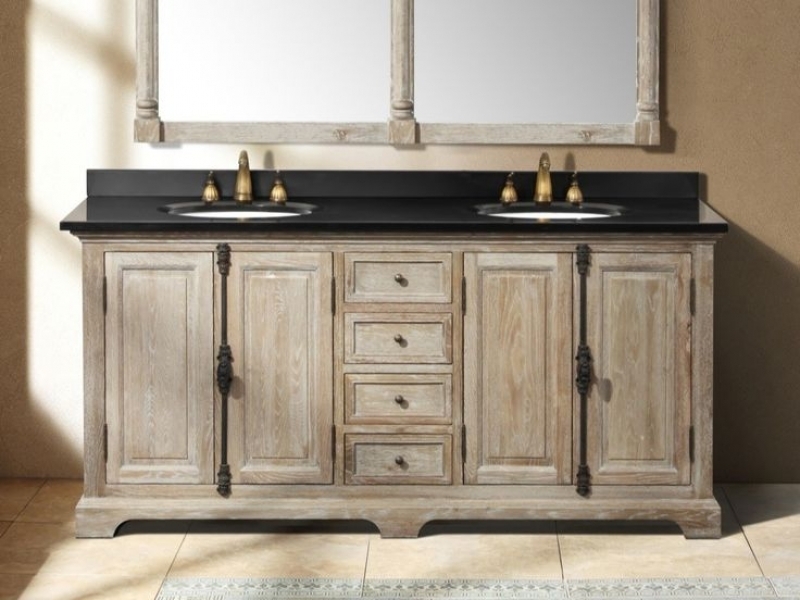 I absolutely love the distressed painted look of this rustic vanity. 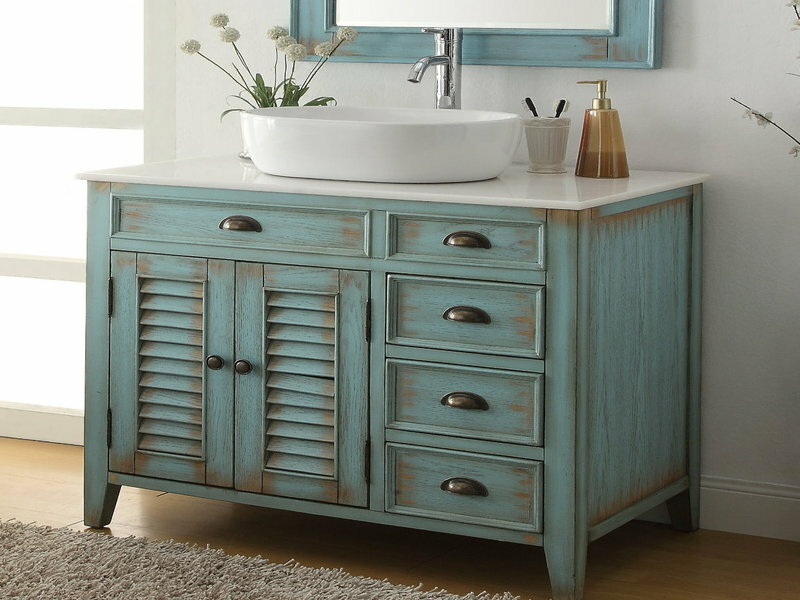 This vanity would fit perfectly inside a Cape-cod styled home on the beach. I love the louvered doors and the cabinet hardware. 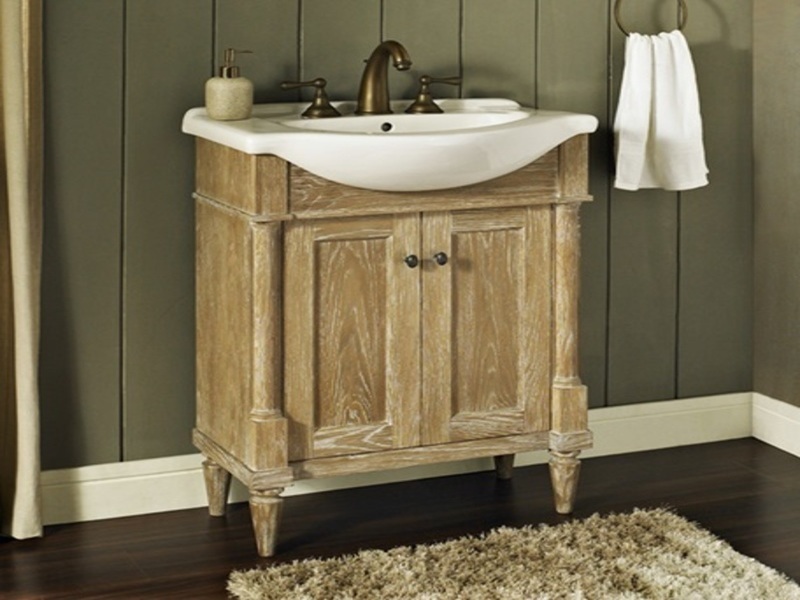 This is a lovely single sink driftwood bathroom vanity with brass furnishings and a white quartz countertop to finish it off. I love the cabinet draws and the open base concept for simple storage. This is the perfect cottage or craftsman styled home. I’m a big fan of louvered doors and the hardware and countertops look great as well. This is a beautiful and out of the box thinking with the pallet or barnwood style wood look. 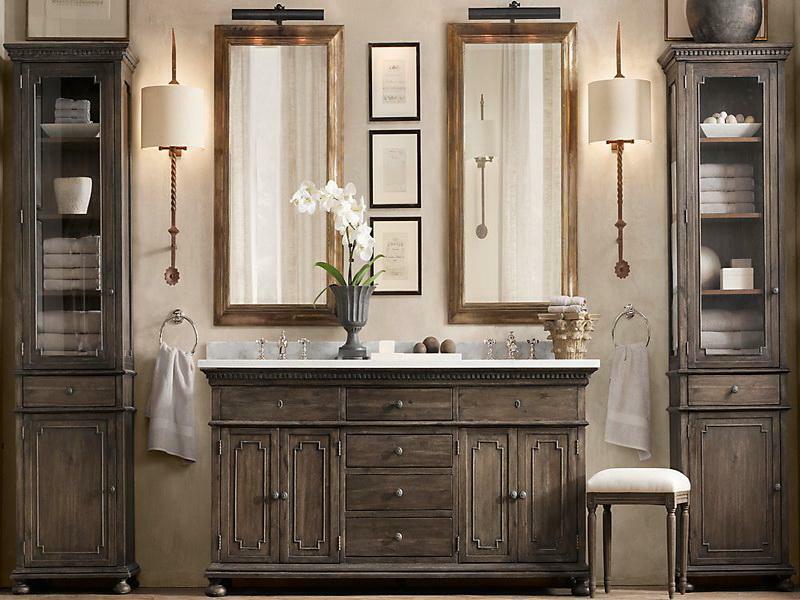 This double sink vanity would be sure to please anyone entering this bathroom. 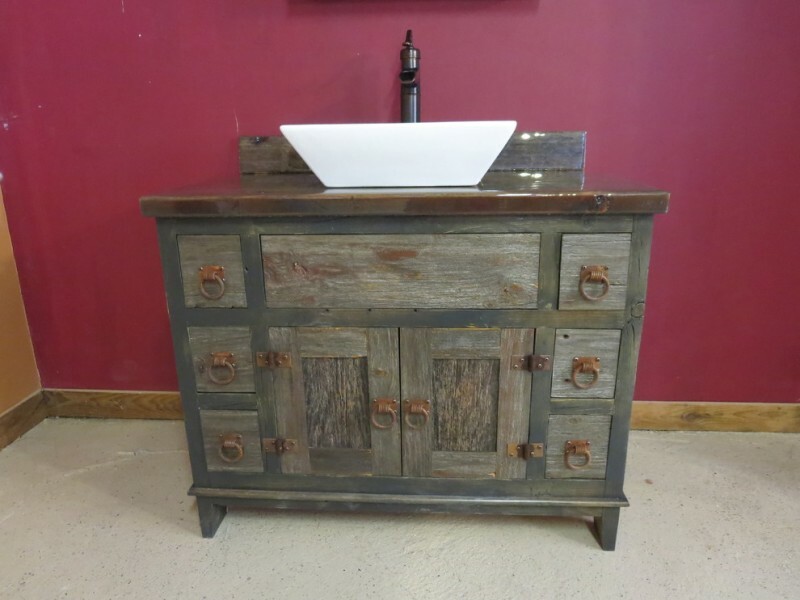 This is a great looking antique rustic vanity with looped styled hardware and a butcher-block style countertop. For those looking for a more modern and fresh look to a rustic styled theme, this is sure to please the eye. This cabinet has stunning hardware and I love the black countertop to finish it off and the wood grains flow nicely. 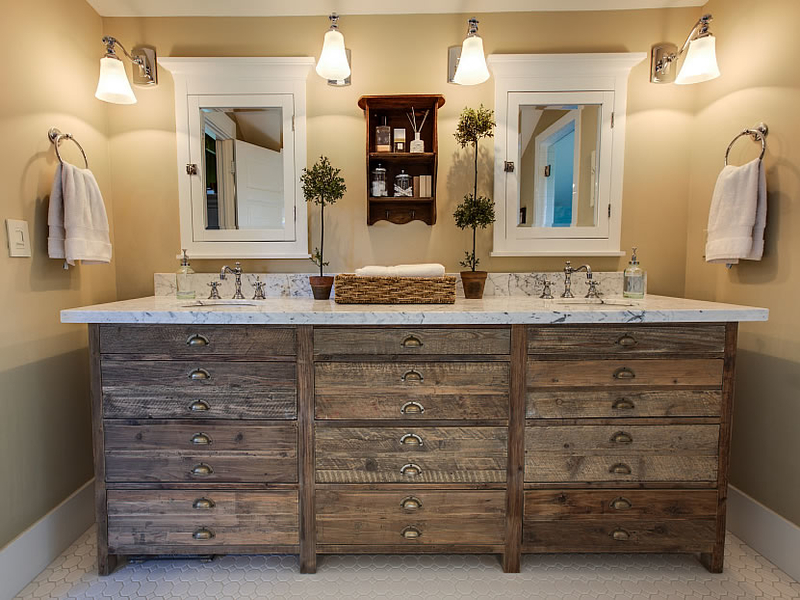 Love the large tub style sink in this vanity. 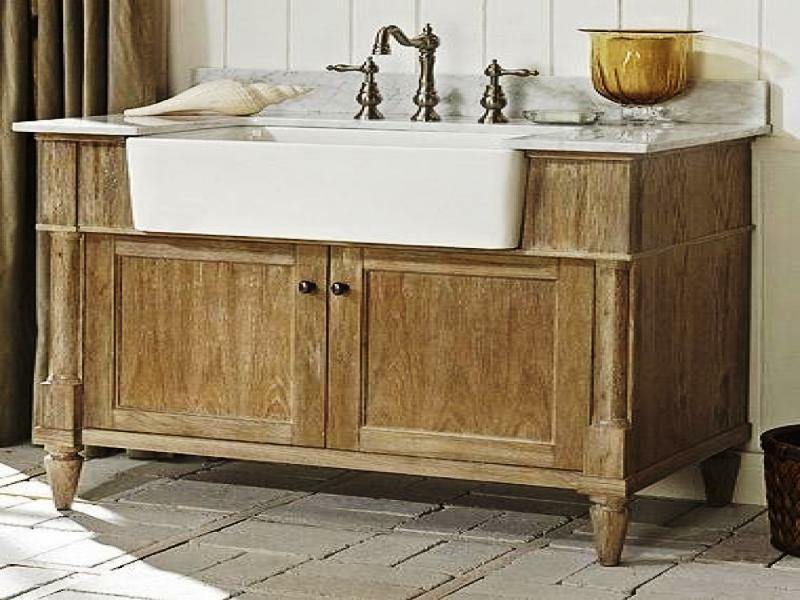 A bathroom vanity in weathered oak giving an earth-bound natural feel showcasing a farmhouse sink. I love this antique rustic weathered look to the finish. The trim detail on the doors flow nicely with the style and dark colored stain. I love the brass faucets and white marble countertop. 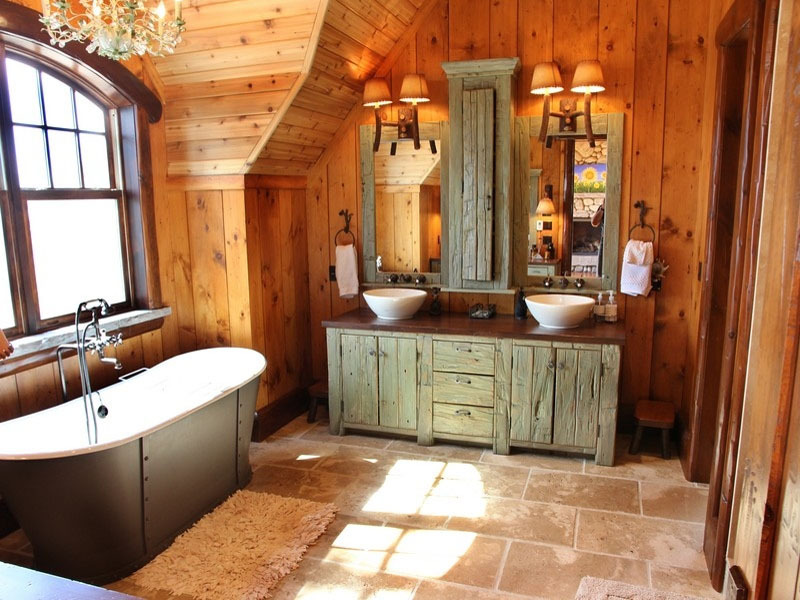 This is a stunning small rustic farmhouse bathroom. 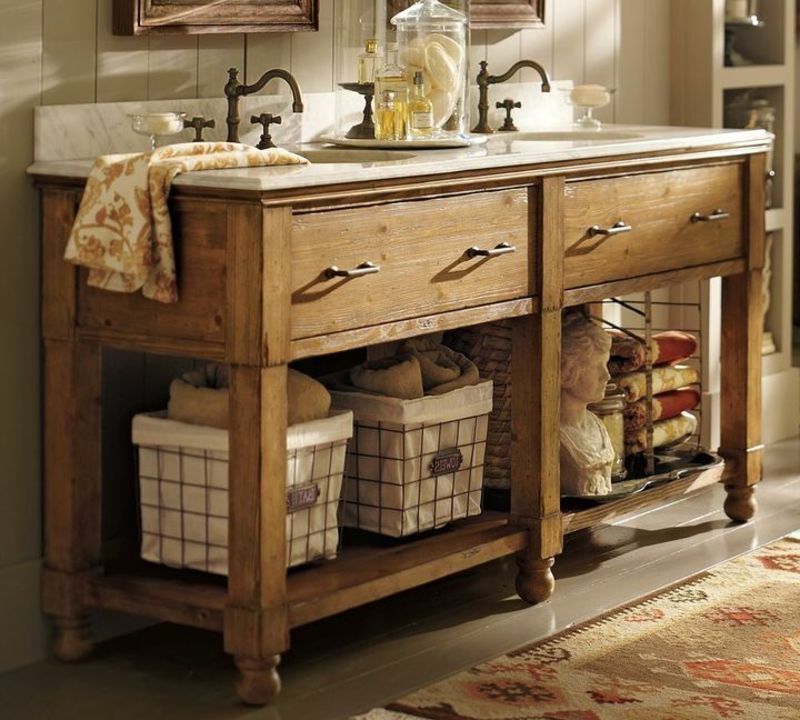 I love the distressed barn-door and draw look to this vanity. The weathered green look flows perfectly well with the dark walnut stain. A lovely bathroom overall. 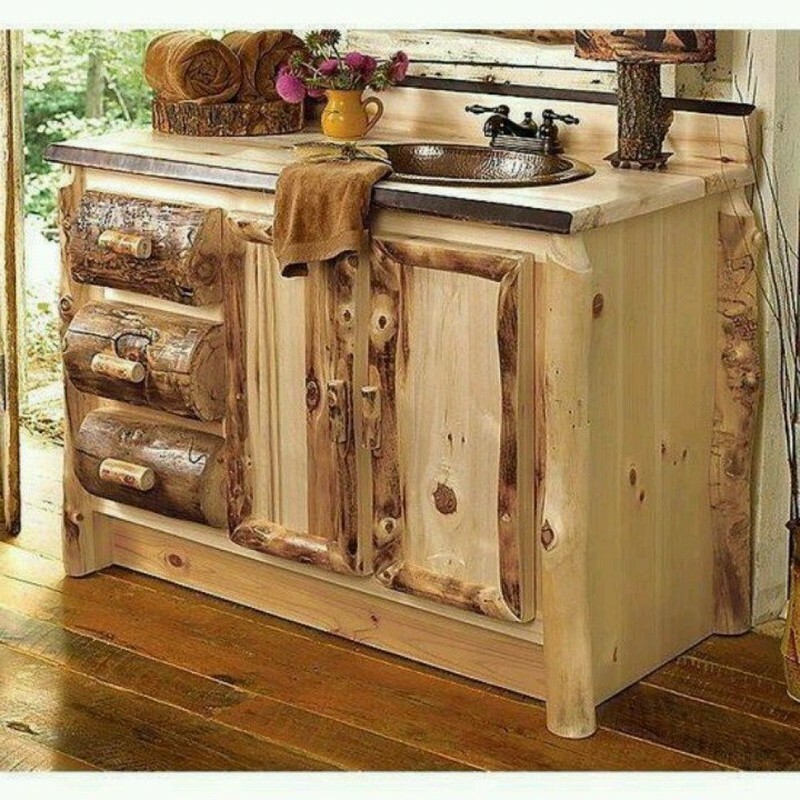 This is a really cool log cabin rustic style bathroom vanity. I love the natural look of the stain finish and the textured copper inlayed sink. This vanity brings the outdoors in and I really like it. Rustic iron laced finish meets quality with craftsmanship here. I love the cherry stain finish and Granite countertop. 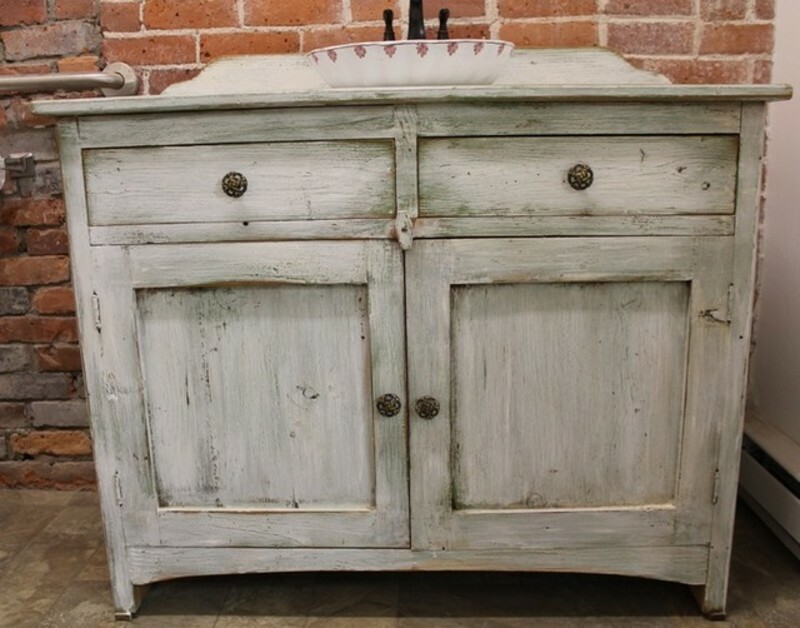 This is a beautiful antique white washed and distressed single sink vanity. I love the antique hardware and sink. 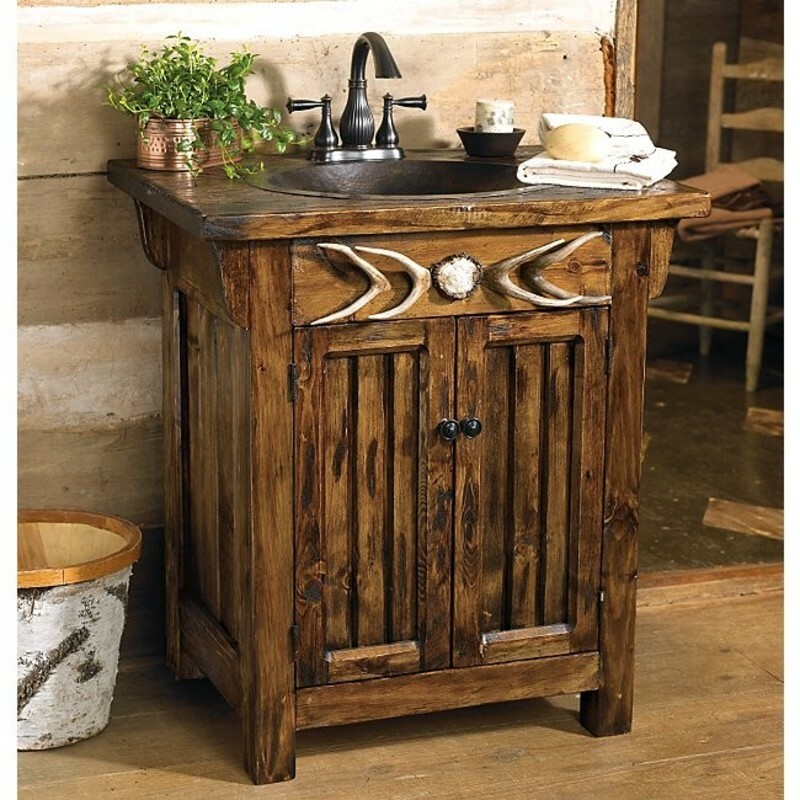 This is a cool Country style rustic vanity boasting a Antler styled knob on the draw. I love copper sink with a butcher-block countertop. Nicely done! 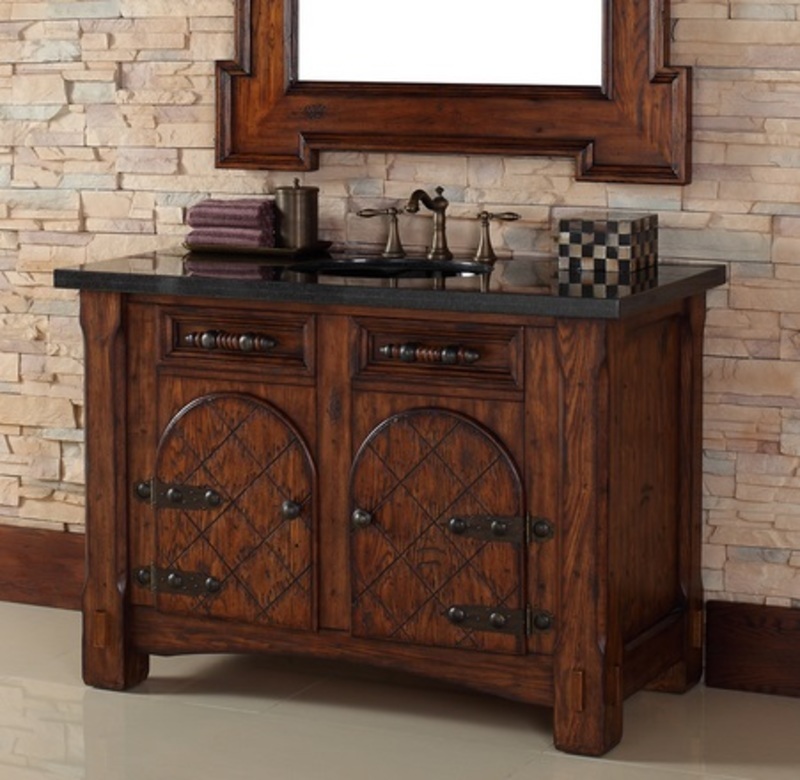 This rustic brown washed vanity features stunning hardware and a white marble countertop. What an impressive way to bring the outdoors in with the tree-branch supporting the granite countertop. Great overall theme and choice of colors. 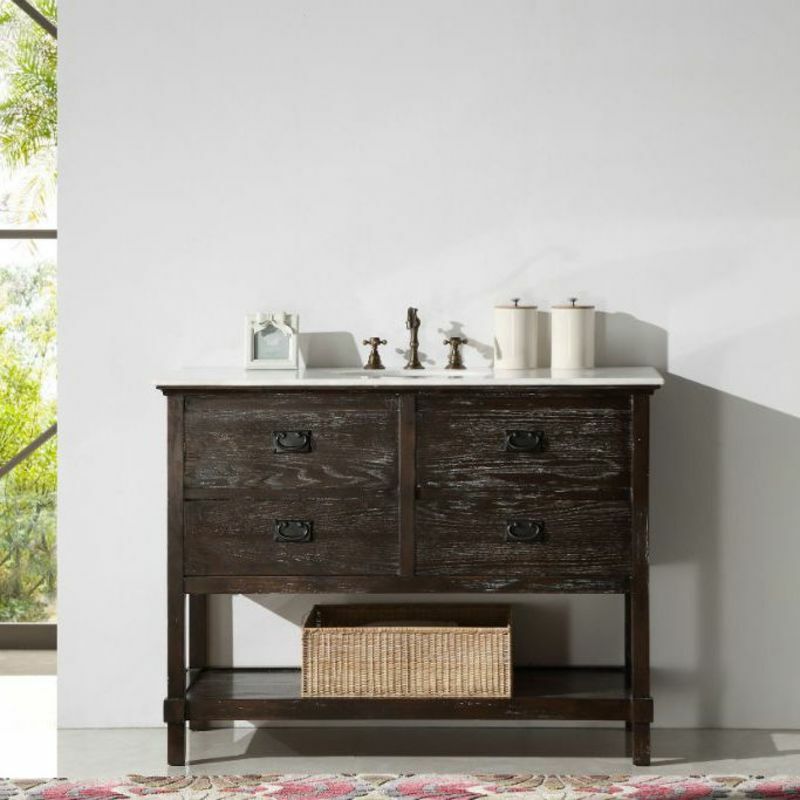 Well, there you have it, 17 Amazing rustic bathroom vanity ideas that are sure to please or inspire anyone in the market. 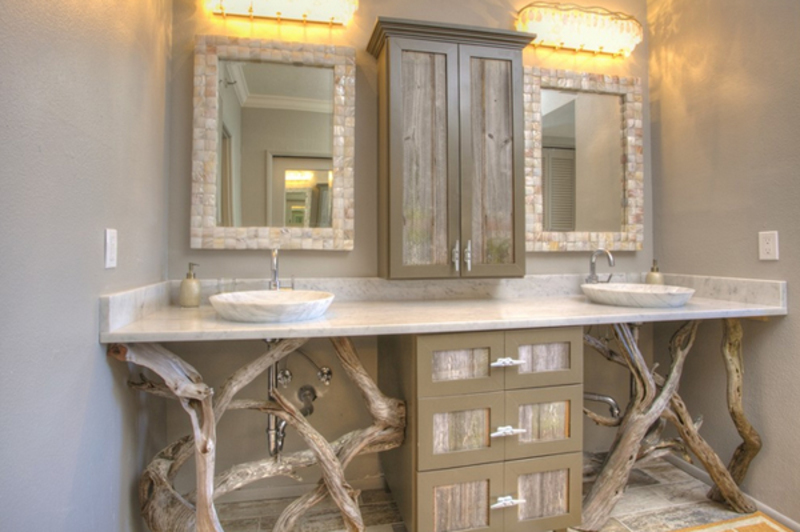 Have a cool rustic vanity you’d like to share?